This is Man Booker Shortlist #4. A while in coming. I hope to be writing more! All the Man Booker Shortlist books are about the fragmenting of society in all sorts of ways. This one is quasi-dystopian, using current societal issues (nativism, nationalism, xenophobia and so on) to describe what might occur in another place and another time. The conceit the author uses is of doors that open onto another geographical place where people can go to begin again, find another (not necessarily better) life, or just remove themselves from the terror that approaches where they are. I was reminded of C.S. Lewis’ Narnia books, where entrance to the new world was through the door of a wardrobe. And, like Exit West, every time the children go through the wardrobe door into Narnia, they arrive in a different place. Returning to where they had been born was unthinkable, and they knew that in other desirable cities in other desirable countries similar scenes must be unfolding, scenes of nativist backlash, and so even though they discussed leaving London, they stayed. Rumors began to circulate of a tightening cordon being put in place, a cordon moving through those of London’s boroughs with fewer doors, and hence fewer new arrivals, sending those unable to prove their legal residence to great holding camps that had been built in the city’s greenbelt, and concentrating those who remained in pockets of shrinking size. Whether or not this was true there was no denying that an ever more dense zone of migrants was to be found in Kensington and Chelsea and in the adjacent parks, and around this zone were soldiers and armored vehicles, and above it were drones and helicopters, and inside it were Nadia and Saeed, who had run from war already, and did not know where next to run, and so were waiting, waiting, like so many others. She had always had carp in a mossy pond in the back of her house, carp that her granddaughter called goldfish, and she had known the names of almost everyone on her street, and most had been there a long time, they were old California, from families that were California families, but over the years they had changed more and more rapidly, and now she knew none of them, and saw no reason to make the effort, for people bought and sold houses the way they bought and sold stocks, and every year someone was moving out and someone was moving in, and now all these doors from who knows where were opening, and all sorts of strange people were around, people who looked more at home than she was, even the homeless ones who spoke no English, more at home maybe because they were younger, and when she went out it seemed to her that she too had migrated, that everyone migrates, even if we stay in the same houses our whole lives, because we can’t help it. We are all migrants through time. 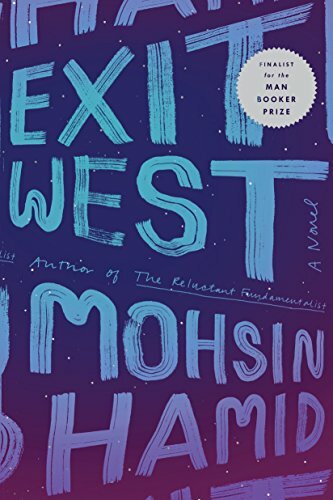 “We are all migrants through time,” and I commend Exit West to you.